This is the second of two winners I tried recently from Kraft's South Beach Diet line. The first was Toasted Wheats. Check out the review here. This Whole Grain Crunch cereal delivered on the first bite. There's a lot going on in your mouth when you have a spoonful. There's familiarity with traditional wheat flakes. There's a vanilla/almond flavor burst from the almonds and "artificial and natural flavors". And there's a smoky maturity in the puffed rice. Healthy or not, this is a downright tasty cereal. It's lightly sweetened, which translates to "properly sweetened" in this case. The 3/4 cup serving they determine the nutritional information from is a little small. I found it took a full cup to satisfy my morning hunger. As for nutrition, that 3/4 cup serving only has 150 calories with milk and only 2.5 grams of fat with 0 trans fat. If MrBreakfast.com had a cereal of month category, this would get the prize. Hey... you know what... I'm Mr Breakfast... I can do what I want... 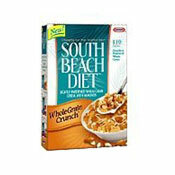 Try South Beach Diet Whole Grain Crunch - It's Mr Breakfast's Cereal Of The Month! What do you think of South Beach Diet Whole Grain Crunch? Can't find it here anymore, and I loved it too. I love this cereal. Where can I find it? I used to buy it at publix. I live in Titusville, FL. Can we purchase any products on line please advise!! gwenschoenfield@yahoo.com Thank you in advance!! Excellent products. Hey people... I actually buy mine at the 99 cent store. There's all the flavors... and no, they are NOT expired. Love this cereal! Can't find it anywhere now. What's going on? Looked all over for it cant believe its gone. Was my favorite cereal - bring it back now. I want it back NOW!!!!!!!!!!!! 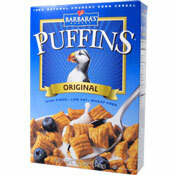 This was the best cereal and very affordable, actually it was to inexpensive. Please consider bringing it back. Hey Kraft - Bring this cereal back! Can't believe you lost money on it! Kraft has discontinued and replaced with much more carb-laden cereal with dried strawberries... tastes like cardboard! Have they stopped making this cereal? Is it being marketed under another name? I have never been much on cereal, but this is the absolute best; & now the grocer that has been ordering it for me can't get it. Kraft, are you listening? Any news on what has happened to this excellent cereal? I used it and also shipped it to my mother in another state as she loved it. Now I can't find it anywhere... HELP! Only cereal I really like. Now can't find it anywhere! I live in the Tampa Bay area in Florida and they have discontinued the product. Where do I buy it now? WE FOUND IT! A&P, I think we were in Hazlet, New Jersey. Bought 10 at $3.99. It's the absolute best. I live in Michigan and could only find this cereal, a great product in my opinion, for a short time. What happened to it? I love this cereal too. First I bought it at Kroger until they stopped carrying it. Then I found it at WalMart until they stopped too. This summer I bought the last 9 boxes in clearance at Schnuck's. I've been trying to call Kraft, but line is always busy. I'm on my last box! Help? I love this cereal. I bought it a my local food chain on clearance. I would like to buy more. Was it a clearance item because the store is discontinuing this item? I used to stock up at Wegmans, because no other store carried it in my area (Syracuse). Now Wegmans doesn't even carry it! What's going on? Very delicious! If you live near Richmond, VA - you can buy it at ukrops!! I adore this cereal and attribute it to helping me take of 30 lbs. However, I have a REALLY hard time finding it and when I do, I buy 10 boxes. That is why I'm on line right now. I'm searching to buy it somehow! Amazon sells it for nearly $5 a box...rip off! I love this cereal and now it is not available at any stores in my area. Why? Do health food stores carry it? I was buying this cereal at Krogers, but they quit carrying it. Now, I can't find it. Where can I buy it? What is going on with it? It's excellent. Yes, I also noticed stores have stopped carrying it. Wonder if its legit? Or if they are reformulating it? Awesome cereal - noticed that some stores do no carry it any longer - what happened? I just bought this yesterday and I must say, I love it! It literally takes my huinger away for at least a couple hours. It's so tasty too. To me, it tastes like macaroons. Love this cereal as well.